The newest high end hardscape products are from Bellgard . 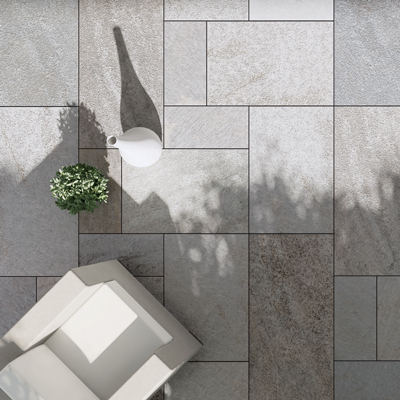 Known for their outstanding line of interlocking pavers, retaining wall systems and other outdoor living products, Bellgard has recently launched a new product line of porcelain pavers imported from Italy. 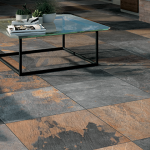 To see more Belgard product here, go here. This new product line is available in both ¼” and ¾” thicknesses. The benefits of these outdoor pavers are frost resistance, skid resistance, durability and ease of cleaning. In addition the pavers can withstand weights of up to 2,000 pounds, making them an ideal solution for gardens, patios, and high traffic areas. The pavers can be laid on grass, gravel, dirt or sand or onto terraces and roofs using raised supports without grout or adhesives. Installation is incredibly simple. Bellgard’s porcelain pavers are resistant to chemicals including alkalis, acids, chemical agents and salts. These pavers are also stain resistant and deter mold or moss also. Other benefits include ease of cleaning or pressure washing, ease of installation, ease of removal (a 24” x 24”slab weighs only 37 lbs) excluding installations with adhesive . And finally, structured top textures on the surface of these pavers create non-slip surfaces. These high end hardscape pavers can be laid directly on lawn. More typically these pavers are laid on gravel or on a bed of mortar over concrete. The Mirage series comes in a variety of “stone” finishes, “Quartziti, Ardesie, Espirit” And another popular option in a “wood” finish appropriately named “sundeck.” The “signature” series offer a plank shade 12” x 48 34”. Thirdly, a “concrete’ finish completes this new line. Various “trims” and pool coping materials are also now available. For a high end hardscape effect, these superior paving elements will surely be the future of outdoor hardscape. Belgard does offer an uncompromised level of quality and craftsmanship which are all supported by a lifetime limited warranty. Contact Letz Design Landscape for your new hardscape design needs today.